"On its journey to being recognised as THE reference for world time wristwatches, Vogard has reached its second milestone with the launch of the CHRONOZONER - a watch that sets a new benchmark for world time chronographs designed for internationally-minded sportsmen. 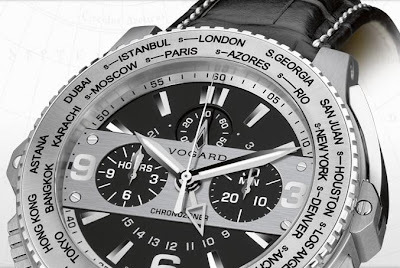 The CHRONOZONER presents itself as a legitimate challenger to the finest chronographs in the world, because it combines Vogard's patented time zone adjustment system with a superb-quality chronograph mechanism and because it presents a unique arrangement of the crown and the pushers. A peak performer both on the track and off it, the CHRONOZONER is designed to withstand the rigours of competitive sport while remaining superbly stylish - from the Kentucky Derby to the Monaco F1 Grand Prix or from the America's Cup to Dubai's Powerboat Challenge."